There are things that I am really, really no good at. Just a few short weeks ago I mowed the yard for the first time in ages and ages. I don’t have just any yard, I have an acre and 12 trees in the front yard. I did have 4 more trees but I ran into some and gophers killed the others. When you have this big of a yard you typically use a riding lawn mower and if you think they drive like a car, that isn’t exactly right. There’s the brake, sure but to back up you have to put it in neutral turn the key and then push the lever behind you while turning the wheel. Going forward isn’t a whole heck of a lot better for me because I tend to get impatient and get the speed going as high as it will go and then totally freak myself out when I take a tight turn going that quickly. The yard looked like hell which was actually a step up from what it had looked like before, I snorted a bug up my nose, which upon closer inspection turned out to be an ant with wings BUT I only ran into a single tree (go me!) After I was all shoved up on the tree with the tractor still trying to move forward and that pesky tree preventing it I began freaking out and couldn’t remember how to back the thing up. And that’s when I noticed that lots and lots of neighbors were also mowing their yards, but had stopped to watch me. I decided screw a bunch of this and returned the mower to the garage so that I could try again when all of those looky-lous went to work the next day. 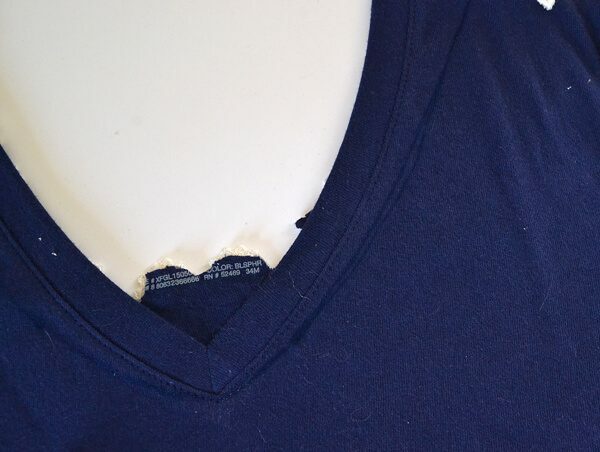 Now you might have noticed that there are needle and thread out but guess what… Before I even got started I was all, where’s that Super Fabric glue? This stuff is crazy tough. You can wash and wash and it stays put making this project way faster than if I hand stitched all of these lace inserts. 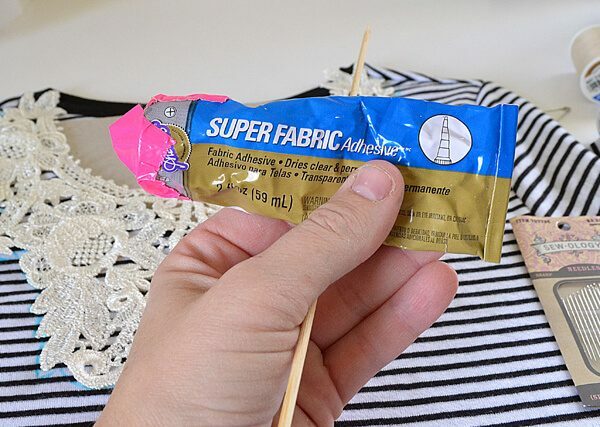 Although this glue is very wash safe I’m still going to recommend you hand wash your tees if you use very good quality lace. Mine are fabulous and will be hand washed only. And here are my lace pieces. Well, a pile of two and then one beautifully laid out! I have been keeping my eyes open for pieces like this at flea markets and antique stores but have had no luck. I was super stoked when I found Tresors de Luxe and ordered up the three pieces you will see here. I was happy with the ship time and very happy with the quality if you’re looking for a recommendation. 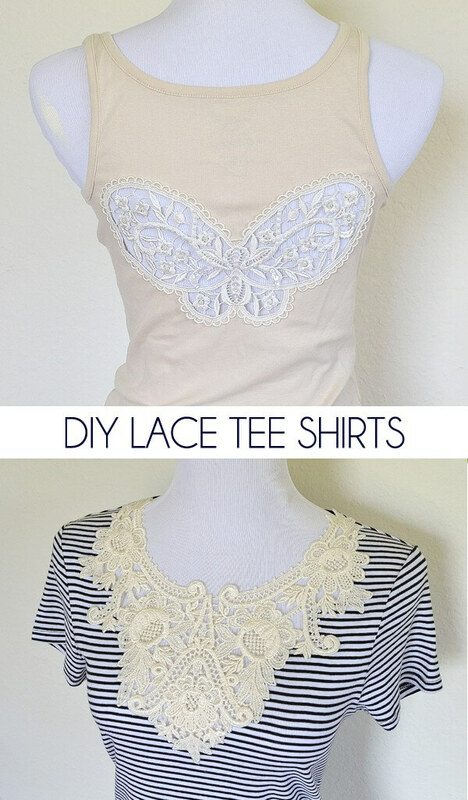 Lay out the lace as you’d like it on your tee. This one is going to be on the front like a bib, but you can also place them on the back, sides, wherever you please, really. Because I want just skin showing through this bit of lace I marked with a safety pin exactly where that’s going to fall on the shirt. I tried it on to be sure I would be comfortable before sticking anything permanently anywhere. 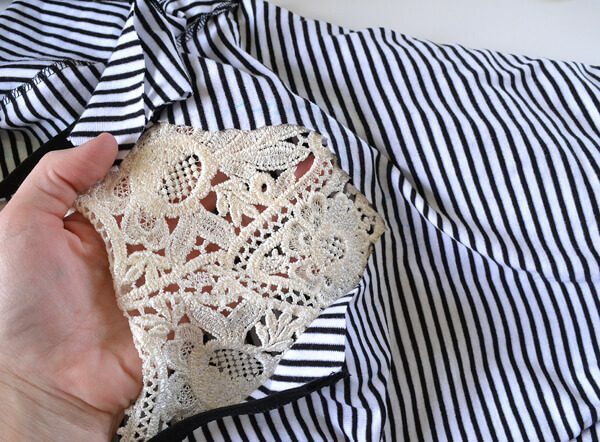 Simply glue down ever bit of the outer edge of the lace piece with your Super Fabric. This stuff is noxious so be sure to have a good cross breeze when working. 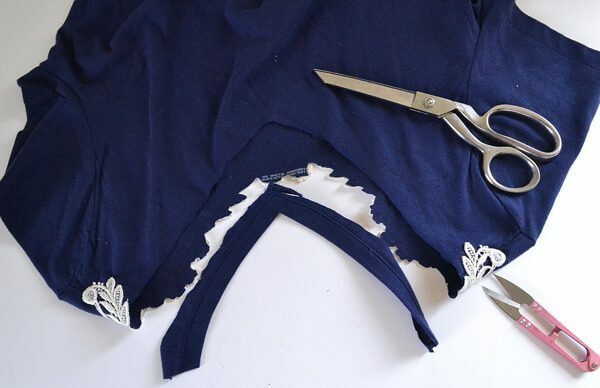 Allow the glue to completely set (I only waited about an hour) and then trim the shirt away that you no longer need! Go in with a pair of nippers to really get in good and close. Glue down any places you might have missed a bit. Isn’t that lovely? 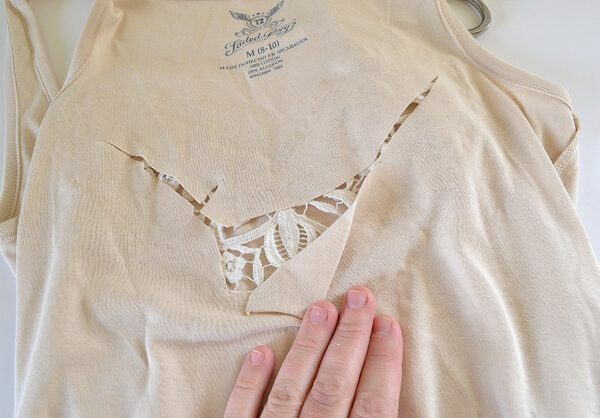 I figured this would be my favorite when I worked it up in my head but I have 2 other pretty awesome tees I made… The next tee I glued my lace onto the back, but I didn’t want any skin showing through so the entire piece was glued down. Going in with scissors and nippers the shirt was trimmed away from the lace to open up the back (so pretty!) 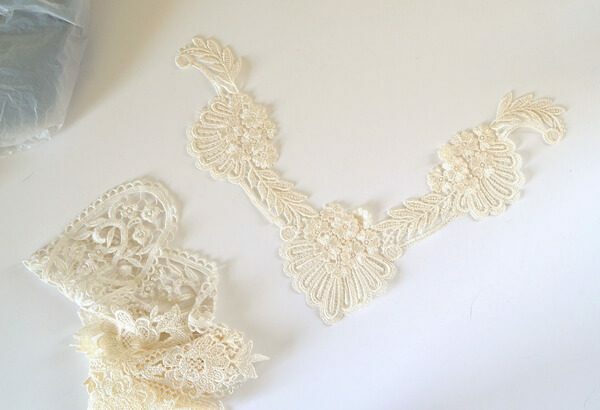 You can find this lace bit here. 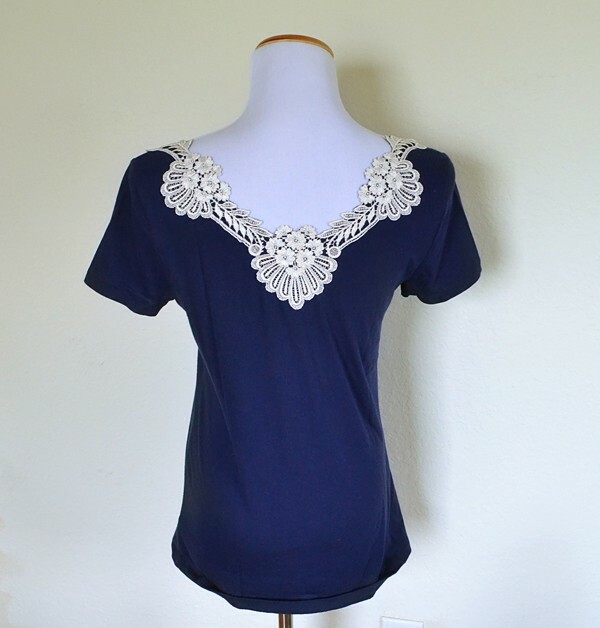 Next to make the front better match the back, I took a dark blue marker and redrew the neckline that would work better. A quick snip with some very sharp scissors and this shirt is done! Isn’t that just lovely? I’ve got to tell you it is such a dream to wear, too. I love it! 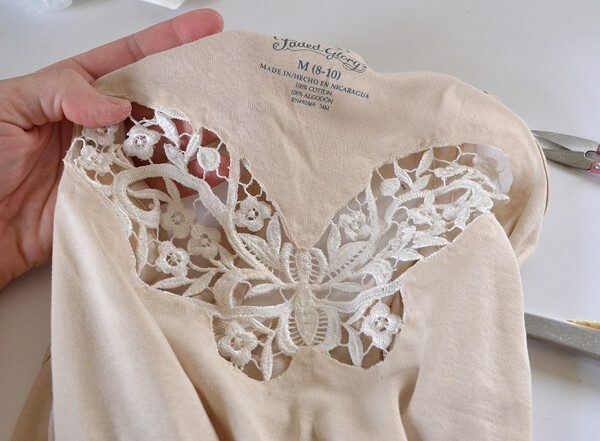 You can find this lace bit here. 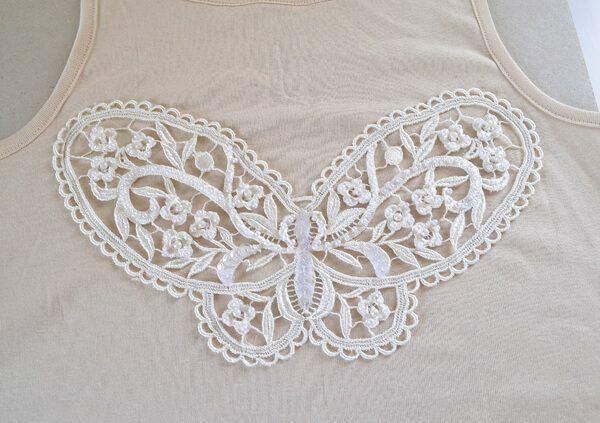 Last but not least this butterfly was glued onto the back, kind of in the middle, of a tank top. Only the outside edges of the butterfly were glued down. 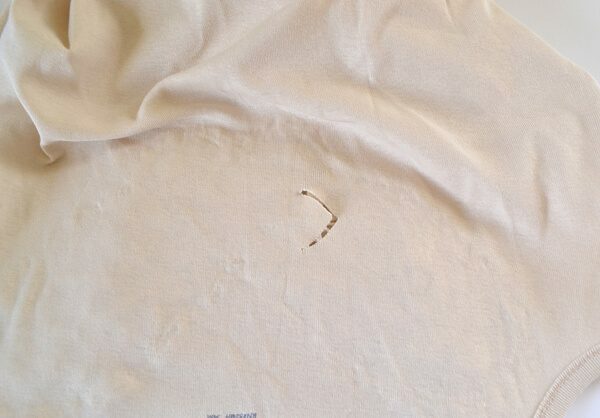 …to better access and trip away the excess tank fabric. Once neatly trimmed, any missed spots were carefully glued down. As it turns out, this tank will be layered as it happens now the butterfly is right where my bra strap would go and the fabric is too think to try and let the girls roam free in this one. But I still LOVE it even though I really waffled on whether or not to even make it! 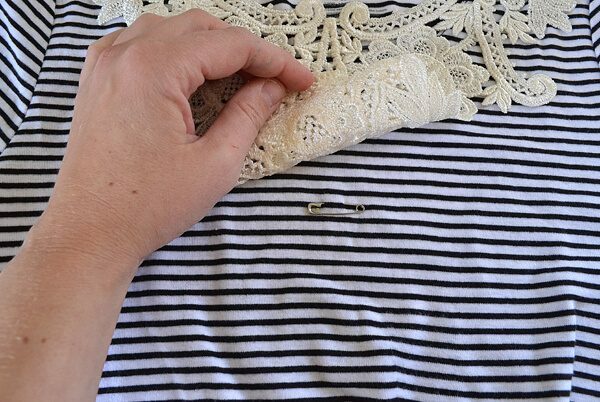 This lace bit can be found here. All it took was about an hour to knock out three fabulously updated tee shirts! How great is that?! Those are so pretty! The butterfly one is my fav! 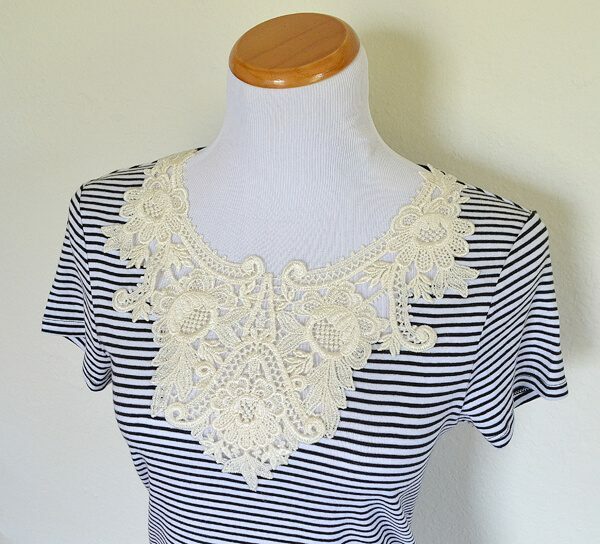 I’ve been brainstorming how to add lace from old table cloths and drapes to some shirts. Thank you for the tutorial! 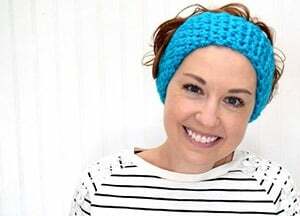 Once my blog is up and running I’ll send you the link to show how mine turned out. And I will definitely link your page to my post, if that’s ok. I’m still learning the rules for copyright laws, and don’t want to step on any toes! That is fabulous! I look forward to seeing your tablecloths! Oh yeah that looks great! My wife did the like of this with one of her pants. I like it.